Numerous citations in various communications by artists, galleries, museums, biennials, etc. 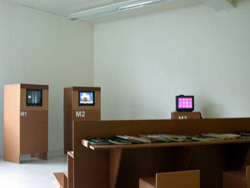 Exhibited at the CCNOA, 2step featured over 40 experimental audio and video works by 37 international artists that primarily work in other media, such as painting, sculpture, installation art, design and architecture. In this exhibition, the artists presented their “2steps” into another artistic medium. Featured artists came from Argentina, Australia, Austria, Belgium, Denmark, France, Germany, Italy, Japan, Luxembourg, the Netherlands, New Zealand, Norway, Portugal, Russia, Sweden, Switzerland, the United Kingdom, and the United States. Participating CCNOA+RPProjects artists include ademXL+MissFit, John Beech + Enar Westerlund, Justin Bennett, Marcus Bering, Hilmar Bjarnason, Kjell Bjorgeengen, Maria Blondeel, Jennifer Bolande, Christophe Dahlhausen, Lieve D’hondt, Peter Downsbrough, Margarete Dreher, Johannes Fox, Marco Fusinato, Robert Glaubit, Marcia Hafif, Lisa Holden, Steve Kaspar, Gerold Miller, Susan Morris, Chris Newman, John Nixon, Annick Nölle + Neven, Susan Norrie, Kelly Parr, Christian Paulsen, Jacqueline Pennell, Beverly Piersol, Mark Pimlott, Gerwald Rockenschaub, Philippe van Snick, Piki + Liesbet Verschueren, Dan Walsh, and Joan Waltemath. Environment by Djos Janssens + Tilman. Afterwards, 2step (CCNOA) traveled to the Kunstnernes Hus art centre in Oslo (2006) and UH Galleries, University of Hertfordshire, near London (2006).